Top o' the Mornin' to You 2010! I chose her technique Tilda card to CASE today because I wanted to try this 'out of the box' cutting technique and I also have tons of Tilda's that I haven't yet inked up! 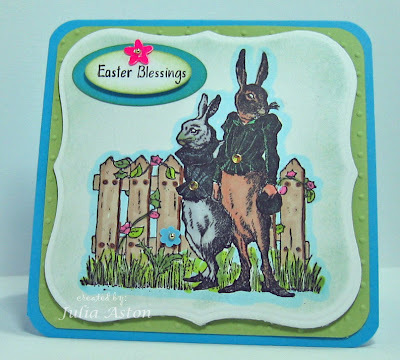 The sentiment and shamrock are from the Irish Blessings set by Waltzingmouse Stamps. 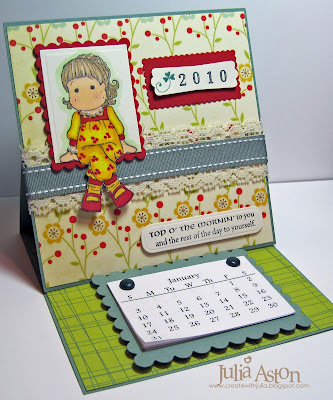 I changed the colors, used different stamps and also made mine an easel style card with a calendar on it. 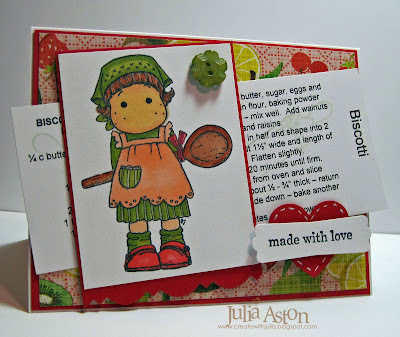 The Saturday Spotlight challenge this week was to put a calendar of some kind on your project. Here's how the easel card looks from the side. 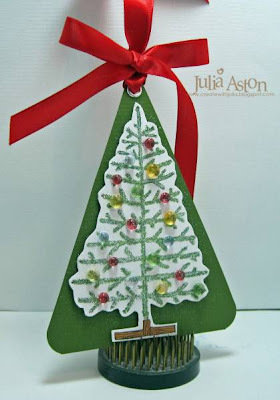 If you'd like to make an easel card you can see my tutorial here. Thanks for coming by today! Got to go help DH shovel snow - again.....! 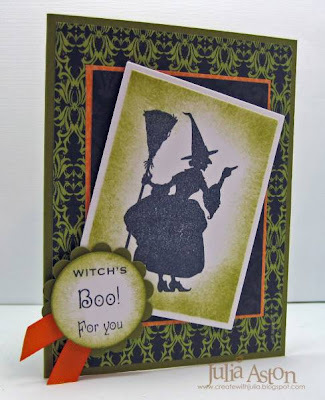 Today's featured stamper on Split Coast was Sparkle (sparkplug17) and what a great gallery to get inspired by. She had a whole album of Tilda cards - and since I have several Tilda's that I love but have yet to use (!) I chose her pink Tilda Birthday to case today. 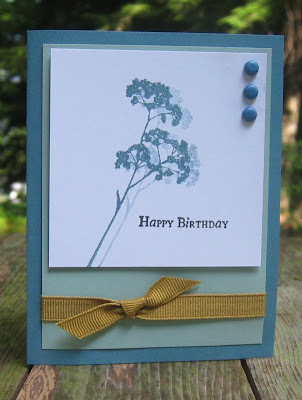 I used a different Tilda than Sparkle did, a thinking of you sentiment from PTI rather than Happy Birthday, and different designer paper - but it is basically the same layout. I distressed the edges of the sewn panel. Tilda, the flower and the sentiment are all up on foam dimensionals. 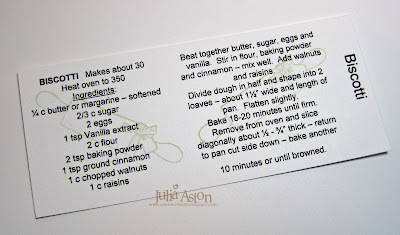 Well - I'm off to make some pecan banana bread using up some banana's that didn't get eaten this past week in my lunches! Spring is coming - really and truly!!! And we see some of it on the Inspiration Challenge web site this week which was Fitz & Floyd. 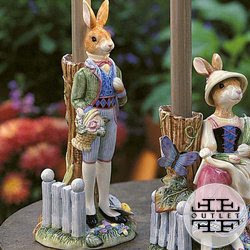 I was inspired by these great rabbit candleholders My rabbits stamp is by 100 Proof Press which I stamped, then masked using Eclipse tape and stamped the fence by Magnolia over the mask. Then I colored the images with copics and prismacolor markers. I used my Labels One nestability for my image panel and my Swiss Dots cuttlebug folder for the 2nd panel. 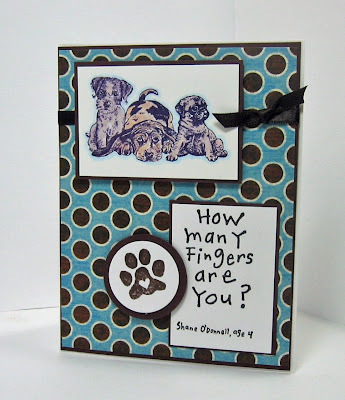 I used an oval punch from Stampin Up on the sentiment which is by Rubber Soul. I used some half gold beads, some tiny plastic flowers and some gold stickers to decorate the images. 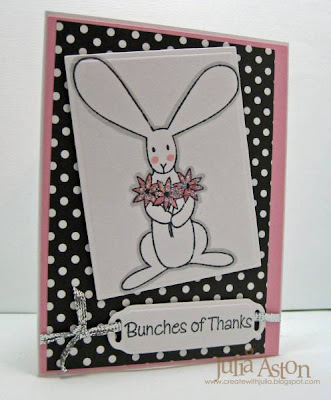 This card also qualifies for the Doubledog Challenge I do each week with a group of friends on Split Coast - Francie G's challenge to us was to use a rabbit on our card. We'd love to have you join in on our Doubledog Challenges - just post your card in your gallery on SCS and use the keyword DDC. You can see all the Doubledog Dare cards here - several new people have played along this week - why don't you??! Hope you are having a nice weekend so far - thanks so much for stopping by! Remember to come by tomorrow for the H&M Design Team Blog Hop - you'll just love all the fun spring projects we have to inspire you! I have 3 cards to share with you today - I was so busy this week doing Sneak Peeks for Artful Inkables that my other cards have been piling up!! I made this 5" x 5" card for the weekly Double Dare Challenge I do with a group of SCS friends. This week I was the hostess and I sent everyone 2 Magnolia stamped images (an Edwin and a Tilda) and they had to pick one and use it on their card. I chose Edwin the skier for my card. I colored him with Prismacolor markers and used Copics for his face. I added punched photo corners that I embossed with the Swiss Dots Cuttlebug folder then topped with dew drops. 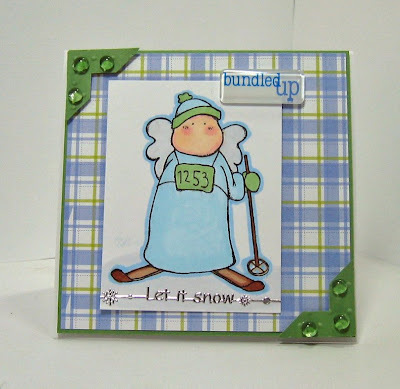 The Let It Snow is a silver sticky strip by Stampendous. I had the acrylic word sticker in my stash and don't remember where it came from (!) - there are 7 or 8 of them with different words or snowflakes - all in white and blue. This is the first time I've used one of them! You can check out the other challenge cards here and you'll see some of the Tilda's. I made this b'day card for my future daughter-in-law, April - who's birthday was 8/10. She was away visiting her mother in NC on her birthday so I will give her this when she gets back. She and my son have 2 bassett hounds and so I'm always looking for anything with basset hounds on it. 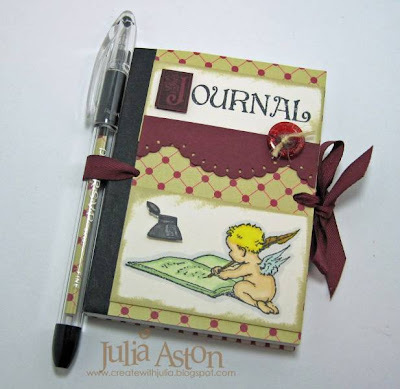 Accessories: Prismacolor markers, brown satin ribbon, foam dimensionals, circle punches. 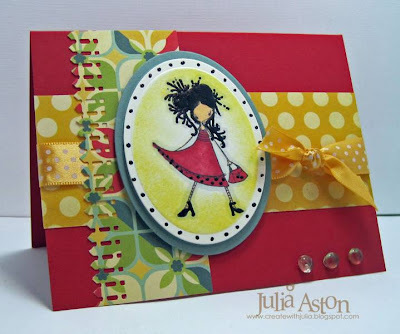 Here is my card for the Ways to Use It Challenge at Split Coast - to use Copic markers to color an image on a card. I have about a dozen copics but haven't used them much yet not having a lot of colors - I usually use my Prismacolor markers and don't do a lot of shading. So my image today is colored with a combination of both kinds. 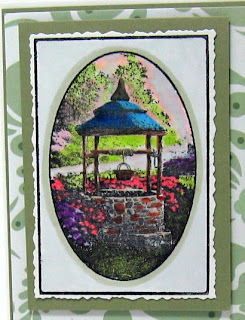 I was quite surprised and thrilled with how the coloring came out - I have had this Kinkade stamp for ages - but have only previously stamped it monochrome - afraid to attempt coloring it. And for my first try I think it came out well - and will only improve as I practice and get more colors! Here's a close up of the colored image. For some reason the colors look a little bright here - it's more subdued IRL! Thanks so much for coming by today! If you leave me a comment I can come by and visit you too! 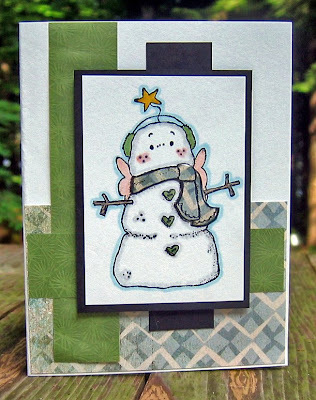 I made this Magnolia snowman card using Lauren Meader's Saturday Sketch seen here. 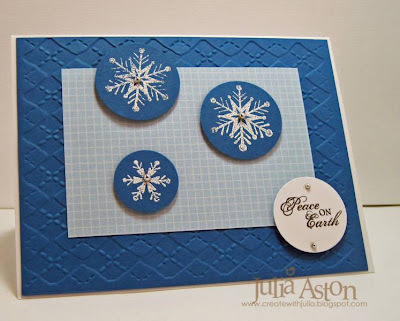 I made this second card for the featured stamper challenge over at Split Coast. 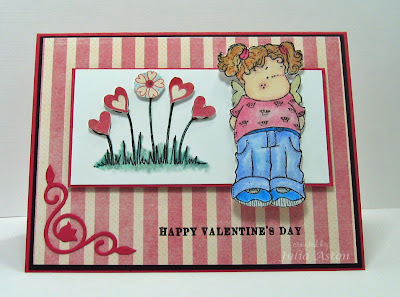 I had not visited Teneale's gallery before and she has some lovely cards there! I decided to CASE this pretty card. 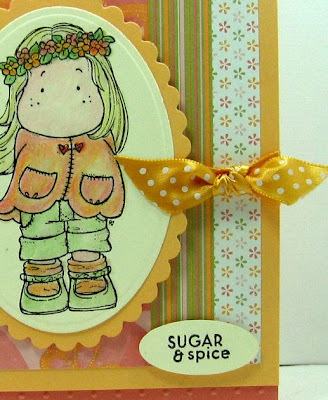 The things I changed: different stamp used, different colors of ink, ribbon and brads - I kept the design the same. I used a flower from the new Plant Prints set from Artful INKables and stamped it once then again, a little to the right, without re-inking to give the shadow effect. 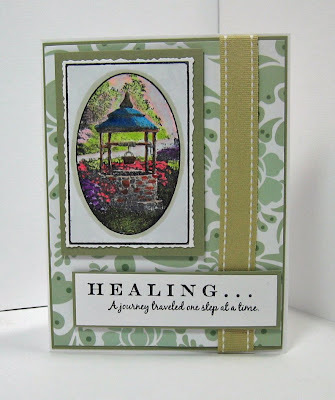 Kristin is offering 10% off all her Artful INKable stamp sets for the month of July - so be sure to check it out! Might as well save money while you're buying some fun stamps right??!! 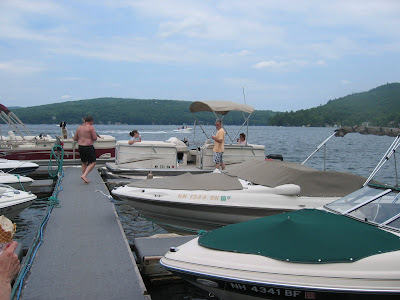 We are enjoying our last day at the lake today - Here are a few pictures from our week here. 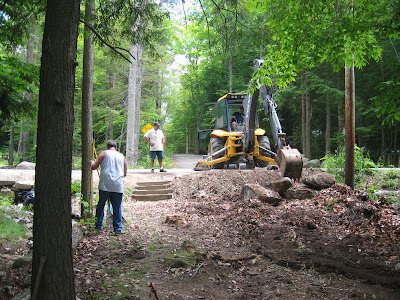 DH Kent and neighbors work on the lake right-of-way clearing the path and placing the boulders they pulled up against the road area to help stop soil erosion. We got a scenic ride to the Marina on Kent's cousins Party Barge where we got some delicious ice cream. 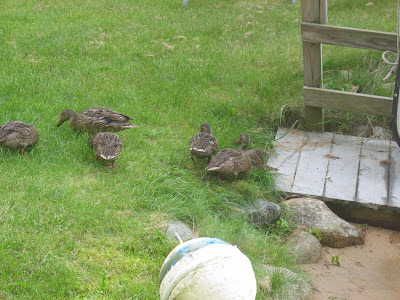 A mother duck and her 6 ducklings come up on our cousins lawn every evening to pick up some easy food dropped from her bird feeders. Thanks for coming by and have a great Sunday!